You’ve read so much on Asia in world history. Ron Takaki (the first ph.d in “ethnic studies” who started that department at Berkeley) claims that “oriental” was a racist term, explicitly, as it labeled those who were “oriented” to the East from Europe as subhuman. What do you think of that argument? On the last point – the author does appear to provide an odd denial of the Armenian “holocaust” (that was clearly genocide – so claimed Amnesty International) and, worse, suggests it was provoked by the victims?? I have not read Takaki but I have wondered how the term "oriental" came to define those with different eyes. 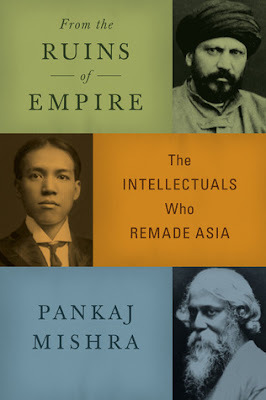 The descriptor "subhuman" may be a bit strong, even for racists, because I think Western political leaders and thinkers, using the language quoted by Mishra in this book, thought that Asians were not developed enough, not civilized enough, not educated enough, not clean enough to take advantage of, not only their own art, items of their own production, and commodities, but the concepts of human rights and human dignity. Regarding Mishra's one sentence dismissal of the Armenian genocide, I am not sure what he was doing here. My sense was that he simply had so much he was trying to focus on--a history of half the world for a fifty-year period--that he could not go into detail. It may be that he is reporting what the Islamists were writing/saying at the time, but I agree he could/should have clarified this for us. There are undoubtedly other areas where folks could take issue with his interpretation, i.e., the Paris peace talks, though I believe the point was to see how that event was perceived by those who did not get the recognition they wanted at the time. Did the author really think Woodrow Wilson was about equality? His racism was so explicit! He showed Birth of Nations in the White House and fired the many Black workers then in the White House. (His wife was uncomfortable in close quarters with Black workers.) See Loewen's Lies my Teacher Told Me. I do not think Mishra was so much focused on Woodrow Wilson except with regard to how his published "Fourteen Points" was perceived by aspiring nationalists around the world. Those people in far-flung parts of the world knew nothing (and cared nothing) for Wilson the man. They cared for the ideas he represented and what those ideas meant for their struggles to be admitted as full partners to the League of Nations.